1. 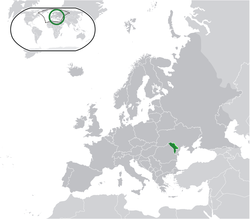 "Moldovan" used as formal official name; in fact Romanian. 2. Proclaimed. Finalized along with the dissolution of the USSR in December 1991. 4. 2004 census data from the National Bureau of Statistics. Figure does not include Transnistria and Bender. "Moldova". International Monetary Fund. Retrieved 2009-10-01. މި ޞަފްހާ އަށް އެންމެ ފަހުން ބަދަލެއް ގެނެވިފައިވަނީ 18 މެއި 2015، 01:40 ގައެވެ.